The Muppets’ latest trailer may have been the final parody trailer, but it isn’t necessarily the last we will be seeing of the parody campaign. 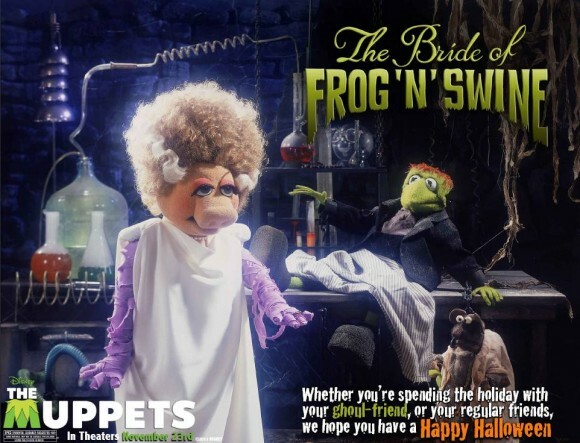 To commemorate Halloween, the studio has sent us an exclusive Halloween card from The Muppets featuring Ms. Piggy, Kermit the Frog, and Rizzo the Rat in “The Bride of Frog n Swine”. Get it? It’s a parody of The Bride of Frankenstien. Hit the jump to see this very cool card. The Muppets opens in theaters on November 23rd.